The following article, written by Travis Ewen, is part of an ongoing series that focuses on a select topic of inspiration for the month. The focus for June is “illuminate”. It’s 4:00am on a Monday morning on September 30, 2009. The cabbie is outside my apartment laying on the horn a half an hour before schedule. I fumble to get ready to meet my 5:45 am flight to DC to observe the construction of a 1.1 million square foot mixed use development. I have gone through this weekly shock to my system for close to 2 years and today I am making what will be my final trip. As a young landscape architect, I thought construction administration was the pinnacle of a career: get away from the computer, get on site, feel the fresh air, all while guiding the project to its built completion. The reality is most of the time was spent in an underground garage ripe with the smell of wet plywood and porta-potties while engaged in heated debate with obstinate contractors; and yet none of that mattered, I still felt like I had finally “made it”. That day on site would be the first day that Athena Tacha’s light installations would be up and running. It would be the culmination of an 8-9 year on-again off-again collaboration with world renowned sculptor, public artist, and tour de force Athena Tacha. My job that day was to make sure our punchlist items were complete. This meant I needed to do a tour of the site at night to ensure the site lighting was operational. I started my career at CRJA-IBI Group in 2000, developing a comprehensive landscape master plan for this nine-acre urban mixed-use development. 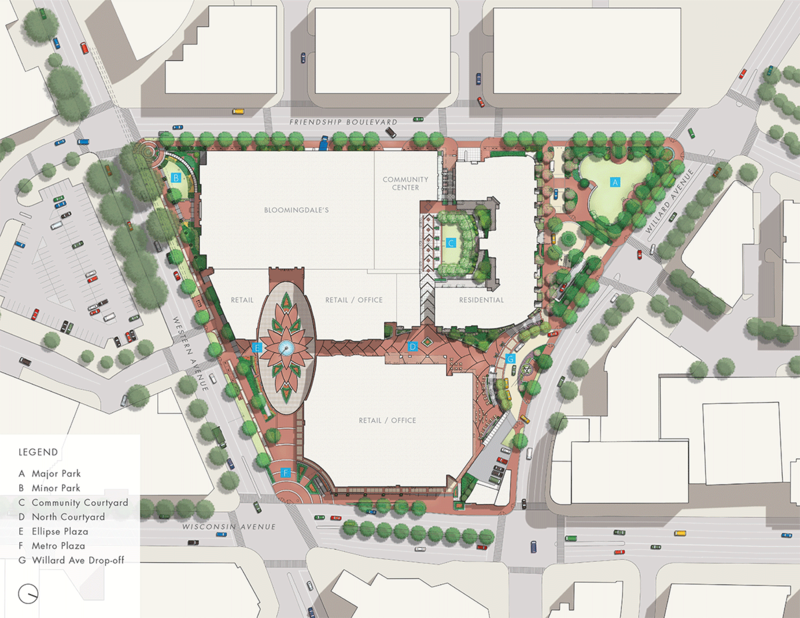 The project includes a mix of high-end retail, office, and residential spaces, a community center, underground parking, two public parks, extensively landscaped public plazas, and streetscapes. The plan evolved over several years through a collaborative dialogue with Montgomery County citizens and public agencies, as well as development teams for adjacent urban development projects. The plaza’s pavement, an homage to Michelangelo’s Campidoglio Piazza in Rome of a similar oval shape, is inspired by curvilinear W’s that stem out of the central fountain like petals of a giant bloom – with six of the “petals” becoming planters surrounded by stone benches. 1. Distance – Conceptually, the public art needed to be seen from two distances. It needed to be seen from over 100 feet away so that people exiting the Metro station and crossing nearby intersections would be drawn into the site, while also focusing attention around the immediate retail core formed by an elliptical building mass. 2. Time – public art should be most successful at prime retail hours as well as different seasons. 3. Space – The landscape and architecture should act as a frame for the public art by reinforcing the artful qualities of the work and enabling it to be a seamless part of the space. 4. 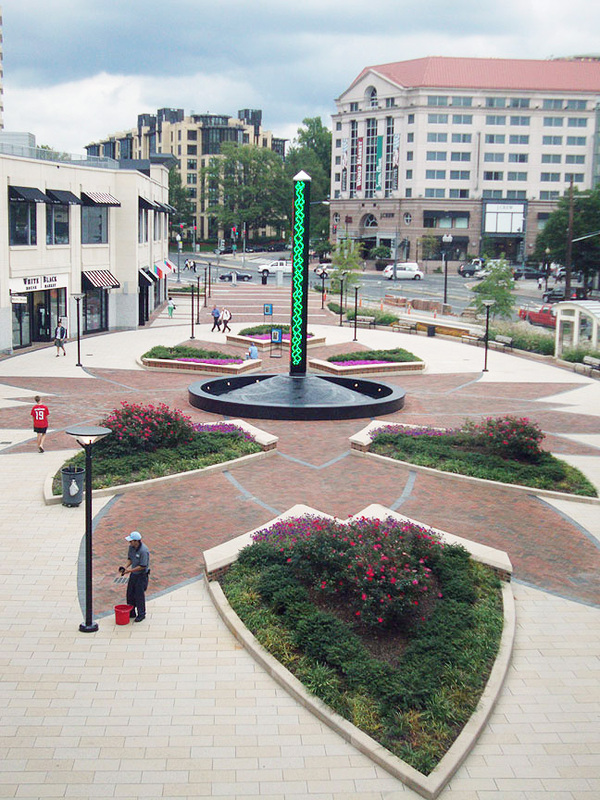 Place – Through integrating the overall space with the public art, we hope to create a sense of place for those who shop and live in Friendship Heights. 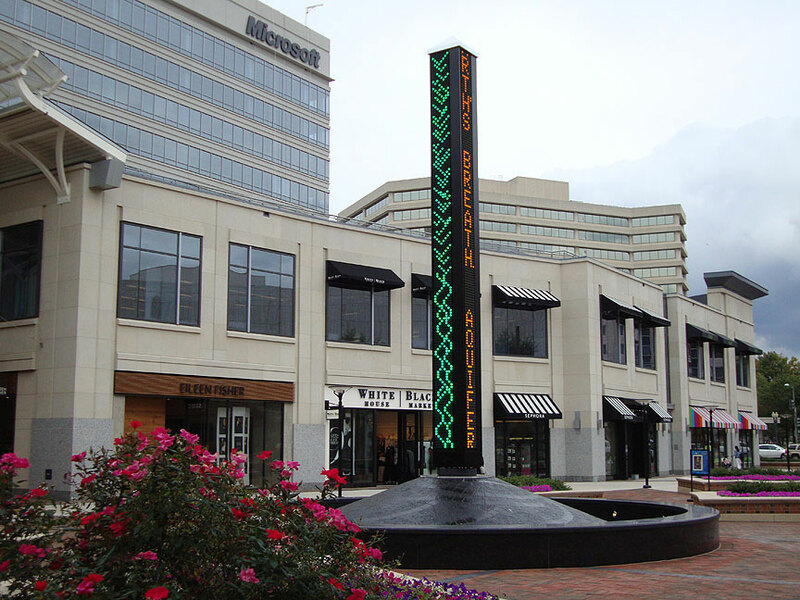 The Light Obelisk on the fountain (referring to both the Metro signposts and Washington’s Memorial) rises 25 feet as the focus at the crossing of the axes – from the main street corner to Bloomingdale’s, and, through the Light Riggings activating the Arcade, to the office and condominium towers – and, down to the 35-foot WWW-Tower, the culminating beacon at the Willard entrance. “IN THE BEGINNING THERE WAS WATER, A GIFT TO EARTH FROM COMETS HURTLING THROUGH SPACE. WATER COVERS TWO THIRDS OF EARTH’S SURFACE. OCEAN TIDES ARE EARTH’S BREATH. AQUIFERS ARE EARTH’S ARTERIES. SPRINGS AND RIVERS ARE EARTH’S VEINS. WATER EVAPORATES INTO CLOUDS AND RETURNS TO EARTH AS RAIN OR SNOW. EVERY 3100 YEARS ALL OCEAN WATER IS RECIRCULATED THROUGH THIS HYDROLOGICAL CYCLE. WATER IS UNIQUE BECAUSE ITS MOLECULES CAN BOND LOOSELY, YET BE ORDERLY LIKE A CRYSTAL. WITHIN EARTH’S TEMPERATURES WATER CAN EXIST IN 3 STATES, AS LIQUID, SOLID AND GAS. SURPRISINGLY, WHEN WATER FREEZES IT EXPANDS AND IS LIGHTER THAN ITS LIQUID FORM. THE FLOATING OF ICE PREVENTS THE OCEANS FROM FREEZING SOLID. CURRENTS OF COLD OR WARM WATER MOVE YEARLY THROUGHOUT THE OCEANS LIKE A CONVEYOR BELT, AFFECTING EARTH’S WEATHER AND CLIMATE. THE UNIQUE NATURE OF WATER MADE THE MIRACLE OF LIFE ON EARTH POSSIBLE. LIFE WAS BORN IN THE OCEANS AND CANNOT EXIST WITHOUT WATER. OCEANIC MICROBES AND ALGAE PRODUCE MOST OF THE OXYGEN WE BREATHE. IN ALL LIVING THINGS, WATER LUBRICATES, CARRIES FOOD AND MEDIATES CHEMICAL REACTIONS. BABIES FLOAT IN THEIR MOTHER’S WOMB. OUR BODIES ARE MOSTLY MADE OF WATERY FLUIDS: BLOOD, SALIVA, SWEAT, URINE, SPERM, MILK, LYMPH AND DIGESTIVES FLUIDS. DAILY WE EACH NEED 2 PINTS OF WATER TO FUNCTION. YET DRINKING WATER IS SCARCE FOR MANY ON EARTH. HALF OF ALL PEOPLE RELY ON WATER COMING FROM OUTSIDE THEIR OWN COUNTRY. MOST FRESH WATER IS USED TO IRRIGATE CROPS, BUT INDUSTRY ALSO CONSUMES IT ABUNDANTLY. AN ENTIRE TRUCKFUL OF WATER IS NEEDED TO PRODUCE ONE PAIR OF DENIM JEANS. GROUND WATER, RIVERS AND OCEANS ARE CONTAMINATED BY PESTICIDES, FERTILIZERS, THE MEAT INDUSTRY, HUMAN SEWAGE, TRASH DUMPS, OIL SPILLS, INDUSTRIAL EFFLUENTS AND HAZARDOUS WASTE. INDUSTRIAL AND VEHICLE EMISSIONS POLLUTE THE AIR AND RETURN TO EARTH AS ACID RAIN. OCEANS AND WETLANDS CAN ABSORB POLLUTANTS BUT HAVE LIMITED CAPACITY FOR ABSORBTION. WETLANDS ARE DISAPPEARING AND IRRIGATION DAMS ARE REDUCING THE FLOW OF RIVERS TO THE OCEANS. NATURAL ECOSYSTEMS ARE BEING DESTROYED. In our collaboration, I had never seen the text in its full form. It served as a reminder of the great natural resources the earth provides; as a point of reflection; and hopefully as inspiration for change. As I stood there preparing to wrap up my last trip it served as the rolling credits to a long and successful project.